Good morning and good evening! Depending on which side of the world you're on. I'm still going through my lipbalms so I can do a quick review on all of them on the same post. I'm slowly getting better, thankq for all the well wishes =) My voice sounds like a manly frog speaking English/Chinese since yesterday. I'm kinda hoping that tomorrow I'll still be in the same state so I can call in sick. You won't believe how badly I want to call in sick. I didn't do much on Saturday. I wandered around Hongik University, I'm sure it was the Hongdae area. Anyway, there's quite a few things to see...a lot of mini stores that sell pretty clothing and a lot of accessories. I just did a simple look, didn't feel like using a whole bunch of stuff on my eyes. 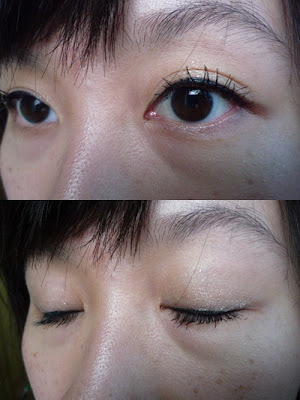 I did a look similar to Fuz's Korean actress inspired look, it's just black liner and very little eyeshadow. It seems so rare that I don't use eyeshadow. I've been using the UDPP for a few years already and I noticed yesterday that the Coffret D'or shadow creased! Hopefully it's not the CoD shadow that's creasing, but if it's the UDPP, I still got another new tube to go through before cracking open the BE Prime Time. I used the MM Frame Expander Plus mascara plus the Fiberwig. I wanted to really "beef" up my lashes since I wasn't doing any special shadow look. I think I was using the P&J lipstick in 062. I'm a bit tempted to use falsies, but I'm sure it'll end up in failure then I'll get so frustrated. In the close up, I actually forgot to apply the Coffret D'or shadow before tightlining, so it smudge a wee bit when I attempted to apply it. The liner is also a bit thicker than in the picture. I've tried the MUFE Aqua Eyes, but it smudged terribly. I really like the texture of the MUFE liner but I had to give it up. The P&J liner stays on but it's not as soft as the MUFE liner. Oh! My eyebrows are started to get fuller too! I've been usin the Ardell Brow and Lash Growth Accelerator for the past week and a half and it's really starting to make a difference. I don't use it on my lashes because I have the Canmake Lash Essence. 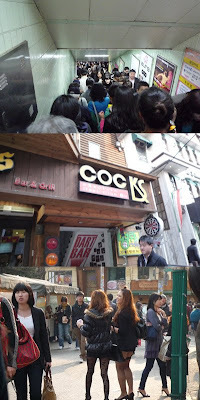 So in the Hongdae area, there's a lot to see. According to some foreign teachers that I know, the areas south of the river (can't remember the name) is considered the rich area. It's actually a HUGE difference compared to the area that I'm living in. There's more shopping, restaurants and university students, so it feels a bit safer to be walking around at night. 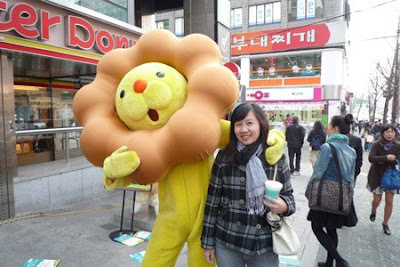 I met the Pon De Ring Lion!!! I wanted to take the blankets and plushies that were behind me. Going back into the subway and this was at around 5:30pm on a Saturday. The lovely DHC Store. I went inside and it was empty!! It's so awkward to have the SA following you when the store is empty. I found collagen capsules for 25000won, I might go back to get it. It'll save me more money than adding it into my 4000won Smoothie Kings everytime. wheee. is the lion donut. haha. is DHC.. is it expensive over there? (in Sinchon actually..) I go there all the time lol Those two girls look Japanese "Gyaru" girls to me. They must be freezing..
oooh I love pon de rings!!! i would love to have ur cute freckles, i always adore girls with freckles, its too damn cute!!! Wow I must try that"Ardell Brow and Lash Growth Accelerator($4)" it's a drugstore brand and not overpriced. 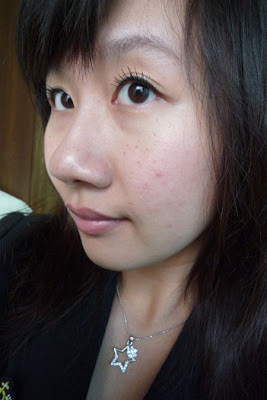 I had DHC eyelash tonic($10)and Talika eyelash conditioner($14). I might throw them away regardless I still had much left, especially the DHC one, the bottle is transparent and I can see the serum's messy and gross. ahhhh *POINTS* Pon De Ring Lion!!!! cutee! It is kinda awakard having SA's follow you. I always feel so rushed don't you? Hongdae... I'm there almost every Saturday, it's a feat trying to get my friends to go anywhere else! A total foreigner magnet, but the reason so many young people go there (and that there's a good nightlife) is that it's the central area between 3 of the best universities in Korea including Hongik the best art uni, hence the cute shops. Nope, not a manly frog but a sexyy lady! 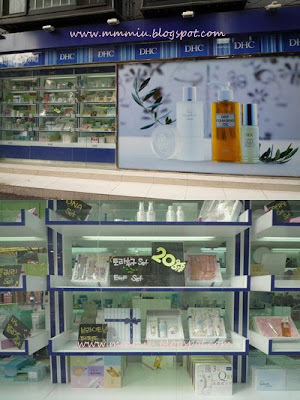 I love DHC, esp their cleansing oil and facial cottons! Your lashes look incredibly long!! That lion is soooo Kawaii...! I just got some sheep coffee mugs today shaped like...erm, sheep--I couldn't resist! the lion is totally cute! I love your simple look! DHC my fav XD your lashes look so pretty~!! your eyelashes look so lush! i love it~ the natural look is very nice too ^^ if i put eye makeup on, i usually put on eyeshadow and NOT eyeliner and mascara.. but.. hmm, maybe i should try the other way around. 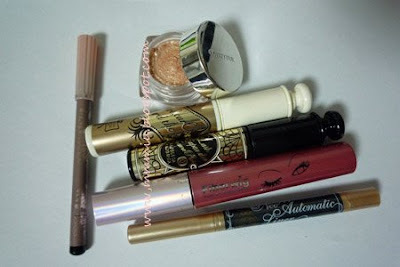 Actually the MUFE liner smudged on me last week, I was so annoyed! It was probably due to the heat on that day so I guess no matter how expensive the liner it doesn't always hold up. ah!!! those donuts are my fave!!! my friend introduced those donuts to me when i went to japan last yr. so yummi!!!! miu: when is the best time to travel to Korea ? I'm thinking to visit Korea in May or June, is that the best time ? Your lashes look amazing! Pity the aqua eyes smudged on you! I find it works really well to tightline with! Hey Anonymous! I bet you have crap eyelashes like the rest of us Asian women, so don't criticize genetic features beyond someone's control.